It's easy to add some 3-dimensional shape to paper with simple techniques. Each of the projects in this index features one or more paper-shaping techniques. Give each one a try! Browse down this page for descriptions and illustrations of the projects, then select a project and have some crafting fun! Crafts marked with Friday Fun are great for family, classroom or group craft time. 3D Stuffed Paper Turkey - In this project, you will make a 3-dimensional turkey that stands on its own feet. It is made of paper and stuffed with facial tissue. The printable patterns come in two sizes, black & white or color. The turkeys make nice Thanksgiving decorations, and several smaller turkeys can be made into a mobile. Paper Sunflowers - In this 3D paper craft, you will make a life-size paper sunflower blossom. These large blossoms make terrific decorations for a party or event, and work well on bulletin boards, windows or in a child's playroom. The project also includes patterns for smaller sunflowers that can be used to decorate gifts or add a warm glow to your dinner table. Floating Wing Glider Paper Airplane - In this paper airplane project, you will learn how to fold a glider that floats through the air and can be thrown gently or hard. This paper airplane glides on a long and steady path, and can also do stunts. 3D Paper Fish - In this project, make two sizes of paper fish. Weave the tails together in two easy steps to make the fish become three dimensional. The fish can be hung from the ceiling or in a window, and with the slightest breeze will dance about to the delight of all. Circly Snake Friday Fun - Link rings of construction paper together to form a long multi-colored snake that makes a terrific decoration hung from the ceiling, draped around the room, or framing a bulletin board. Turn the activity into a contest to see who can make the longest snake, create the funniest (or scariest) snake, or the most creative snake. Simple Folded Bouquet Friday Fun - In this project, make a pretty bouquet out of construction paper and tissue paper. No pattern is needed: just fold, cut, tape and glue! When finished, the bouquet will be stand on its own and be ready to display. Spring Flower Bouquet - In this project, make flowers from computer paper using several paper-shaping techniques. Make a daffodil, a tulip and an iris, complete with stems and leaves. Use ribbon to tie them up in a bunch, then give them to someone special. 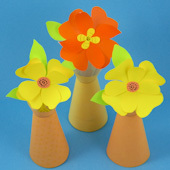 Shamrock Centerpiece - Make paper vases by joining two rolled-paper cone shapes. Use the printable patterns in this project to create a small centerpiece for St. Patrick's Day. Use the plain version of the vase for any occasions and filled it with Paper Flowers. Paper Medallions - Make 3-dimensional paper medallions to decorate gift packages. The medallions are a nice alternative to bows and ribbon, and when made from foil add extra elegance to your present. Conical Tree Ornament Friday Fun - Paper in a simple cone shape can be made into an ornament that everyone will enjoy. With just a few simple supplies, you and your children can make these miniature Christmas tree ornaments. Chinese Paper Lanterns Friday Fun - Chinese paper lanterns make colorful and inexpensive decorations. Best of all, they are so quick and easy you can get the kids involved in making them. Follow the simple instructions in this craft project to make colorful lanterns using a single sheet of paper. Patriotic Star Garland Friday Fun - Cut five-pointed stars from red, white and blue paper and string them to make a garland! See how the fold lines give the stars a 3-dimesional appearance. Use the garland to decorate for Memorial Day, Flag Day or the Fourth of July. Jumping Origami Bunny Friday Fun - With a few folds, create a 3-dimensional paper bunny that you can make hop! It is a twist on the traditional origami leaping frog. Paper Flowers Friday Fun - See how easy it is to make paper flowers. It requires no patterns and uses simple materials. Give the flowers shape by curling the petals and leaves over a round pencil. This is a skill well worth learning! 3D Valentines - Wow! your loved-ones and friends with this accordion-style,3-dimensional heart-shaped Valentine. A special version for children is included in the project. Tip: Combine your 3D papercraft creations. Fill the vase in the Shamrock Centerpiece with Paper Flowers. 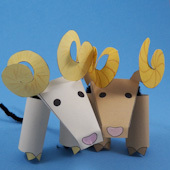 Puppets: Many of Aunt Annie's puppet crafts use 3D paper-shaping techniques. These include: Three-Finger Puppets, Two-Finger Puppets, and Paper Cone Finger Puppets.